Bring home the exact same AMT used in fitness clubs worldwide. The Adaptive Motion Trainer (AMT) 835 with Open Stride™ fits virtually everyone regardless of size and provides an effective low-impact workout. The AMT 835 with Open Stride provides you with an infinite range of stride paths to create a uniquely effective and personalized experience every time - all in one piece of fitness equipment. Side panels are easy to remove for servicing. Twenty resistance levels ranging from 20 watts (level 1 at 60 SPM, zero stride length) to 375 watts (level 20 at 120 SPM, max stride length). Handheld heart rate sensors located on fixed handlebars for increased accuracy and ease of use by exercisers of all sizes. Yes. Equipped for heart rate telemetry reading using a chest strap. An optional electrical power supply is available if your AMT® use will be light. The internal generator must be used enough to keep the console battery powered. 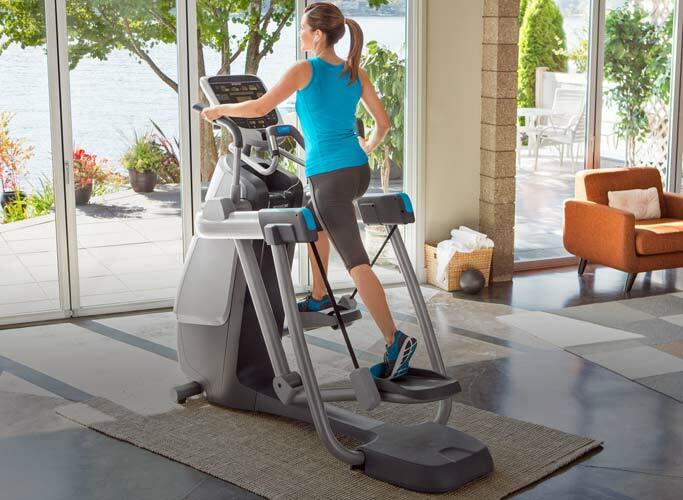 To find out more about the optional power source, contact Precor® Customer Service. Installation of the optional power supply will require a Precor authorized service technician. Printed in English. Available on Precor.com.